This is not a trivial excercise, so unless you like this sort of thing you should at least wait until your guarantee has expired. Don't blame me if it all goes horribly wrong, but the following worked fine for me. Thanks to Vipin Sachdev (reader of a Psion list who found this page useful) and an engineer called Lawrence for the pics of a dissasembled Psion5 on this page. The base is removed by undoing 3 screws: one at the bottom of the battery compartment by the catch (you need to lift the lid), one under the flash card lid where the pen goes (you need to take the pen out), and one under the right hand side of the little 'void if removed' label inside the backup battery lid. The bottom then comes loose. To get it off, slide the keyboard forward and then lift the rear of the case whilst pushing it in the direction the keyboard opens. This releases the three clips just under the keyboard (the middle one is next to the little hole for the 'open/closed' microswitch). This is fiddly as the one at the PC-card door end is tight - an internal vane on the case pushes against a capacitor when you try to release the clip. There is no clearance, and judicious use of just the right level of force is needed. The PCB is held on with 3 screws (obvious), but you can't get it out without removing the rear section of the case (the battery terminals hold it in). To get this off you need to close the battery door then lift the top of the rear piece halfway along (about 1mm) to release the clip there. Now everything is exposed and you just need to release the ribbon holders (slide the 2 ears towards the ribbon entry and the ribbons become loose), There is one for the battery negative/speaker, and 3 for the display/keyboard/touchscreen - one on top and two underneath. Now you can remove the PCB, leaving the chassis, screen and keyboard. Next, remove 2 pins in keyboard/screen hinge. To separate the 2 components then slide keyboard forward on rails until it slips off the end. The screen is separated from the casing by sliding it down. Pull on the inner half of the hinge bulge to get purchase. It's quite stiff but careful levering on the hinge bulges will ease it out. Once it is about 7mm free it comes out quite easily. I couldn't see how to seprate the hinge spring wire from the screen casing in a reversible fashion so I just left it attached. It's not really a problem. Now you can get at the screen flexribbon, which is the bit that usually breaks in my and sachdev's experience. Replacement cables can be obtained from POS Ltd, who are also supporters of the psilinux project. They are not particulalry cheap at GBP 25, but so far as I know you can't get them anywhere else. Here are some more pictures of the various parts, and the device disassembled into major components: keyboard, screen, case, PCB, chassis. These were taken by Lawrence, the Indian engineer who did just that to fix Vipin Sachdev's broken screen cable (It seems that this cable is prone to wear in tropical countries). I have connected my Garmin GPS12XL to my Psion5 for use with palmtop bv's route-planning software and for cave location in Austria. It's not trivial to get this all working if you are making your own cable, so I've documented what worked for me. The psion connector can be bought from CPC Plc. 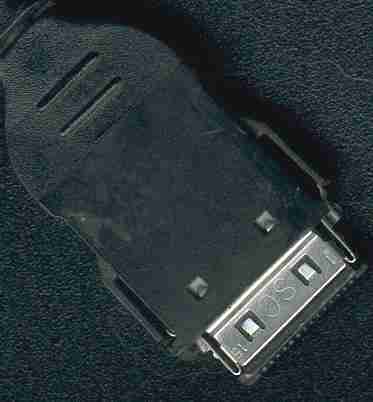 part number:CN00843, described as 'PCMCIA Cable assembly'. £8.95+VAT = £10.52 (The keying is not identical to the psion-supplied part but it fits properly). The Garmin connector is best bought from the pfranc network which is a rather odd 'hardshareware' concept. You buy the connectors from your local franchise and pay whatever you think is 'reasonable' - a couple of quid seems fair. If you also want to connect up the psion power you need the connector: This is a 1.3mm internal diamter barrel plug, also available from CPC Plc: part no. AR70628 (bent) or AR70624 (straight). If the supply is >6V (eg a vehicle) then you will also need a regulator (see the discussion below). The hard bit is knowing which pins in the Psion and GPS connectors are which. You only need 3 wires: RX, TX and GND. For using the system in a car you really want a multi-headed cable that supplies power to the GPS and Psion too. You can make one amazing 4- or 5-headed thing (12V power, psion 6V power, GPS connector, psion serial, computer serial), but I've found it sensible to split the functionality in two or three leads: a 3-headed GPS lead (GPS, power connector, serial connector), and then have adaptors for the appriate power or serial connections (eg: serial connector<->psion serial). Exactly what is best for you depends on how many ways you use your kit. Do you want to power the psion from the car without the GPS present? Do you want to power the GPS from an external battery as well as the car? Do you want to have the GPS and psion serially connected just using internal batteries? How may different leads are you prepared to make/buy? Do you need to carry all this crap up mountains and thus want to minimise weight but maximise versatility and robustness? In practice the garmin connector does not have room for two cables coming out of it so it is best to use whichever connector has most space to do the 'Y' splits. I used the power connector. If you add a 9 or 25-pin D as well (so the same lead can be used for connecting GPS, psion and computer (but not all three at once - the serial ports would argue)) then that might be a good place for the split. Note that the position of the diode is significant. If you put it in the GND lead instead of the POWER lead then (depending exactly how things are connected up) the serial connection may not work as the serial signals will not tolerate the diode in the ground reference. If you want to power your psion from the car or a >6V battery, then you need a regulator to give it the 6V it expects. A simple analysis suggests that as the psion+backlight+serial port draws no more than 160mA a 200mA regulator should suffice. You can get one of these (ZR78L06C) in a transistor package (TO-92) small enough to fit (with care) inside the bent psion power connector, described in parts, above. However I found that whilst this worked fine for non-backlit use, after 20 mins with the backlight on it got unreasonably hot and shutdown. It would work again once it cooled but this obviously isn't very satisfactory and the poor thing didn't last long treated like this (and melted the connector). A bit of thought shows that with the vehicle supplying 14.5V when running, and the Psion5 consuming 160mA at 6V the regulator has to dissipate 1.4W, which is too much for such a small package in an enclosed space. The next regulator is the (L7806CV) which is a larger TO-220 package but will take up to 1.5A, and is still only 70p. The disadvantage is that you can't hide it in the power plug, although you might be able to get it inside a car cigarette-lighter socket - I haven't tried. This is the spec for a standard (as supplied by Psion) serial cable, including the equivalent 25-pin D pinout in case you want that instead/as well. This has RX/TX and RTS/CTS 'swapped' as both devices expect to be 'in charge'. This is what's called a 'null modem' cable. Just want to buy a cable? First make sure that the control-panel link is set to off so that it is not trying to use the port, and that your route planning software is not also trying to use the port. Then run the psion 5's built-in comms app set it to 4800 baud, 8 data bits, no parity, 1 stop bit, 1 start bit. Now set the Garmin to NMEA 1.5 or 2.0 output. You should now see lines of text scrolling up the psion screen. Once you are satisfied that the cable is OK then you can use it with the route planner software. The English section of my manual doesn't say what protocol it expects its messages in, so I had to read the dutch part to find out! It wants NMEA v1.5 or later. You already set this on the GPS in the above stage, so you just quit from the comms app, or set it to 'offline' (to free the port) and set the software to use the GPS. For En route this is done in preferences - reached with Ctrl-K, or Menu->Map->Set Preferences. Just tick the GPS box.